Making Learning Connected is an event we offered during The Summer to Make, Play & Connect by Educator Innovator, powered by educators from the National Writing Project. The goals of this MOOC—our Massive Open Online Collaboration—was to engage participants in interest-driven, making-centered experiences that embody the Connected Learning principles. We worked to adopt a collaborative approach and a reflective stance toward the processes of making and learning, and to provide an opportunity for us all to plan for similar experiences in our varied teaching and learning settings. We are a community of educators and learners seeking to create rich, relevant and connected learning ecosystems. Throughout the summer we engaged in “Make Cycles” together as a CLMOOC community. Different than units or weekly study topics, Make Cycles are open-ended invitations to make, play, learn and connect. These cycles drew from resources and specialities surfacing throughout our on and offline community, and were designed to spark making and connection—rather than being designed as sequential steps that would lead to mastery of predetermined outcomes. If a particular Make Cycle sparked interest or generated community activity, we encouraged that energy forward. Make Cycles only have start dates, no end dates. 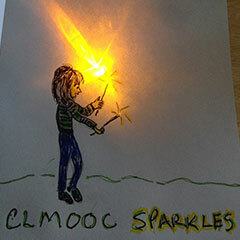 This means that anyone can join CLMOOC at any time. (Follow @clmooc or @innovates_ed to learn more about how to getting connected and involved). Teams from around the U.S. lead the Make Cycles during the summer of 2014, including National Writing Project educators from the Boise State Writing Project, the Northern California Writing Project, the Kean University Writing Project and the Hudson Valley Writing Project. Two more cycles were led by YouMedia mentors from Maker Jawn in Philadelphia as well as a team of CLMOOC “gamers” alongside mentors from Mozilla’s Webmaker community. As a shared framework, the Connected Learning principles provide language and tools to support teacher and learner agency. The ideas that emerge from the CLMOOC summer experience help us all move forward with critical and collective conversations. In turn, we can bring these ideas “home” in our own contexts and communities throughout the year. In this sense, the CLMOOC and Connected Learning experience is also a movement. Reflections and connections abound! This collection highlights some of those we gathered and curated together.